When you make a payment from your checking account (using your debit card, paying electronically, or even writing a check), you’re supposed to have that money available in your account when you make the payment. If you don’t, you’ve got insufficient funds, which means you’ve got problems. Insufficient funds is a situation when your account does not have enough money available to cover a payment. For example, you might write a check or sign up for automatic electronic payments to your electric company. When that payment hits your account (either because your biller requests the funds or deposits your check), the bank compares how much you have and how much you owe on the payment. If you don’t have sufficient funds, the bank can reject the payment: no money will leave your account, and the biller will not get paid. In some cases, your bank will allow the payment to go through – see below. Instead of using the term insufficient funds, you might hear about bounced checks, a payment rejection, an overdrawn account, or non-sufficient funds (NSF). In many cases, your bank will cancel transactions when you don’t have enough money to cover a payment. But it gets worse. Banks charge fees when you have insufficient funds. Expect a charge of $35 or so. Also, whoever you tried to pay will most likely also charge you a fee. A business that deposits your bad check will get dinged by their bank and will pass the charges on to you. Even if you were making an electronic payment, there’s often a penalty for failed payments. Banks don’t like customers who overdraw their accounts (even though those customers generate a lot of revenue). They worry that the bank will eventually have to eat a bad payment and have to try and collect from the customer. 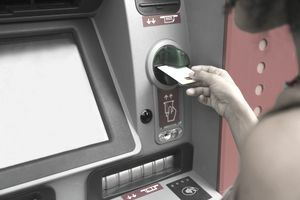 Banks might close your account if you overdraw your account too often, and your name might end up in databases that track consumers with a history of writing bad checks. If you make a habit of overdrawing your account (and you’re not using overdraft protection), you can eventually end up hurting your credit scores – and you might even have legal problems if it seems like you’re intentionally spending more than you can afford to. For most people, this isn’t an issue, but it is a possibility. Banks offer overdraft protection programs to “help” when your account balance runs low. Instead of rejecting transactions, they’ll pay them as if you had enough money, and you need to replace those funds quickly. Overdraft protection is optional – you need to opt-in if you want it on your checking account, and it’s not necessarily a good idea to opt-in. If you don’t opt in, your debit card will be rejected if you try to make a payment that you can’t afford. In that case, you might decide to use a different card, pay cash, or do without whatever you were buying. However, if you do opt-in when you open your account, you’ll authorize the bank to charge overdraft fees and authorize purchases for more money than you have. If you decide that you want overdraft protection, choose wisely. Old-fashioned $35 overdraft protection is rarely your best bet (if you overspend by $2, you’ll pay the full $35 fee). Overdraft lines of credit are less expensive than per-item overdraft fees. Instead of a flat fee, you’ll pay interest on the amount you “borrow,” which is usually less than the fee. Link a savings account to your checking account. Your bank will pull needed funds from savings (although there might be a flat fee of $10 or so – check with your bank). Note that whether or not you sign up for overdraft protection, your bank might still allow payments to go through when you’re short (and charge you insufficient funds fees). Automatic recurring payments, such as utility payments or insurance premiums, will most likely be paid even if you’ve asked your bank to decline transactions when you’re out of money (but verify the process with your bank, so you know what to expect). To avoid insufficient funds fees, keep tabs on your account, and keep some extra cash on hand. Monitor your accounts by logging in online or setting up alerts (or sending a quick text) with your bank. It’s a good idea to review transactions regularly anyway so that you can spot fraud early. Know how much you have available by balancing your account. If you keep track of your balance, any upcoming automatic payments and any holds or freezes on your account; you’ll know how much you can spend even before your bank does.